ASDIP CONCRETE includes the design of continuous beams. This structural engineering software is based on the latest ACI 318 provisions. This article covers the steps in the structural design of concrete continuous multi-span beams subjected to concentrated and distributed loads. Beams are structural elements that support loads applied transversely to the beam axis, which produce a combination of shear and bending stresses. Concrete beams are usually continuous, this is, they span between multiple supports acting structurally as a single element. This is possible because the rebars are placed continuously through the supports, providing a mechanism to transfer the stresses between adjacent spans. How do you generate the shear and moment diagrams? Depending of the type and magnitude of the applied loads, the shears, moments, and reactions will vary along the beam. Since a continuous beam is a statically indeterminate structure, it cannot be resolved just with the static equilibrium equations. Many analytical and numerical methods have been developed to find the reactions, shears and moments along the beam. Whatever method is used, at the end of this analysis phase the shear and moment diagrams will be developed, showing the variation of these internal forces, and therefore the required strengths, along the beam. 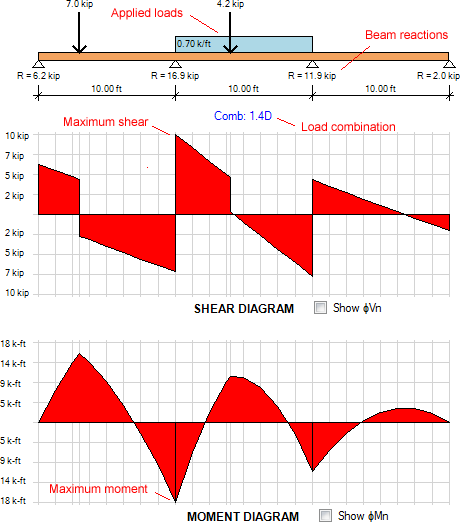 ASDIP CONCRETE accurately generates the shear and moment diagrams, per load combination, as shown below. Is the shape of the cross section important? The cross section of a beam may have different shapes. For example, it’s common to find T-beams at the interior bays of a building floor, where a portion of the slab acts together with the projecting beam web. Likewise, a beam at the border of the floor is called a spandrel, or inverted-L beam. Inverted-T and L-beams are common in precast construction, such as in parking garage buildings, where a beam needs to support a series of double-T members. The ASDIP CONCRETE software includes all these cross sections, as shown below. Being concrete strong in compression and weak in tension, the shape of the cross section plays an important role in the calculation of the flexural strength of the beam. When a beam is loaded, the bending resistance is provided by a couple of internal forces, one in tension and one in compression. To satisfy the equilibrium, both forces balance each other, this is, C = T. The tension force is provided by the rebars, so the shape of the cross section in the tension zone is not as important as it is in the compression zone, where the concrete provides the force to balance the couple. In a continuous beam normally the stresses are reversible: the compression stresses occur at the top of the beam at the center of the span where the moments are positive, but they reverse to the bottom of the beam at the supports where the moments are negative. As a result, the flexural strength will be affected if the section shape is not rectangular. For example, a T-beam reinforced with the same area of steel at top and bottom will have different positive and negative strengths. How is the beam strength calculated? To increase the moment capacity at a given point, generally more rebars are added, provided that the beam is not over-reinforced, in which case it would exhibit a non-ductile behavior. The flexural strength is calculated by finding the couple of forces described above times the lever arm between them. ASDIP CONCRETE accurately calculates the flexural strength along the beam. The image below shows the actual moments and the bending strengths superimposed in a single diagram for easier comparison. The shear strength may be increased with the addition of stirrups in the areas of high shear stress. Where stirrups are no longer required, a minimum number of stirrups is usually provided to keep the horizontal rebars in place. ASDIP CONCRETE generates the image below showing the reinforcement of the continuous beam. Very good read, short and sufficiently detailed for an introductory knowledge of the basic concept. I’ve been using SAP2000 for a while to design continuous concrete beams, but have never been happy with all the work it takes to produce a decent easy to read report (specially for old-fashion town engineers). The reports that ASDIP Concrete generates couldn’t be any better. It shows all the math, equations, code references, load combinations, and, what I like the most is the reinforcement detailing. I only got the ASDIP Concrete module and now I’m considering buying the rest. its don’t worked in length, if we adding the column length don’t change the design output data. That’s because you are specifying the second order analysis loads. If you want the program to calculate the magnified moments due to slenderness then select “Amplified First Order Analysis” under the Loads tab.